A suit is the definitive masculine attire. Whether you are the office person, who has to look sharp in a highly competitive space or whether you just want to dress up like a gentleman, formal occasion or not, the suit is the only choice that you have. The charisma of a suit is inevitable, whether you are wearing a plain suit or a tuxedo. However, before choosing the right suit for dressing up, there are certain key points that you should be keeping in mind, referring to different suit styles. The fundamental categories of suit styles are the single and double breasted jacket. You will have to make the decision whether you would like to wear a single breasted suit jacket or a double breasted one primarily. Your decision should be essentially based on your body type and also your personal preference. For example, it is the general norm that the single breasted suit jacket is more appropriate for slimmer men, while the double breasted suit jacket is more suitable for bulkier man. However, there is hard and fast rule on this. Even slimmer men can wear double breasted jackets if it looks good. Conversely, bulkier men also often prefer a single breasted jacket. The general norm of slimmer men wearing single breasted and bulkier men wearing double breasted jacket arises from the fact that the double breasted cut is wider, therefore providing the necessary balance to a bigger torso. For example, if you want to conceal some extra pounds, you should be choosing a solid black double breasted torso. The suit styles selection does not end with the choice between double breasted jacket and single breasted jacket. In fact, it is only the beginning of choosing the right suit style. After you have made the primary selection, you would have to pay attention to finer details of suit styling like the number of buttons, the number of vents or whether there will be any vent at all, the lapel style, the pockets should come with flaps or should not and whether it will be a three piece or a two piece suit that you will be wearing. These are all essential choices that you would have to be making in order to make sure that you are sorting between different suit styles to ultimately find just the perfect suit for your fit. 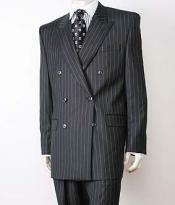 The lapel style is an important element of suit styles. The two main categories of lapels are the notch lapel and the peak lapel. There is yet another category of the lapel, which is the shawl lapel, but it is generally found only in tuxedos and not in the usual suits. Perhaps the reason behind this is that the shawl lapel is fancier and has a certain flow when compared to the sharpness of the peak and the notch. The notch lapel is the most traditional kind of lapel; the peaked lapel came into fashion scene later in 1930s onwards. The width of the lapel is a finer detail of suit styling that should be considered.